Summit Canyon Mountaineering is dedicated to helping people live the mountain lifestyle. Summit carries the largest selection of outdoor gear and apparel in Glenwood Springs. 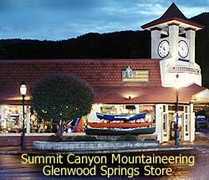 Summit Canyon carries backpacks, maps, luggage, tents, telemark skis, sleeping bags, gloves, snowshoes, avalanche shovels, climbing hardware, hiking boots and trail shoes.